DISCLAIMER: Every patient is different. Individual results may vary and no guarantee can be made. We will discuss your treatment(s), expected results, possible risks, costs and alternative options with you during your visit. Picture Gallery - See more results! Why Choose Amoderm for Cosmetic Treatments? No pressure or obligation to purchase. Only do it if you are comfortable doing it! Natural-looking results. Your own look, only years younger! Click here to see before-and-after gallery of our REAL patients! 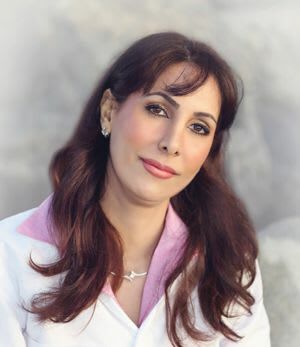 Meet Dr. Elham Jafari, MD, DABPN, a CA-licensed double-board certified cosmetic surgeon, founder of Amoderm, and the leading provider of Botox, dermal fillers, advanced lasers and other outpatient cosmetic and antiaging treatments in Irvine, Orange County. Dr. Jafari is one of the few doctors in the Orange County who provides various fillers including Juvederm, Voluma, Sculptra, Radiesse, Belotero, Restylane, and Bellafill in addition to neuromodulators such as Botox, Dysport and Xeomin. She frequently performs filler injections using micro-cannulas for less bruising and discomfort and better results. She is highly skilled even in most complex filler procedures including treatments under the eyes, non-surgical nose job, hand rejuvenation, and more. Her other fields of specialty include non-surgical fat reduction using Kybella and non-surgical face and body lifts using PDO threads. She also utilized an assortment of advanced medical lasers including Fractional CO2 lasers and Erbium lasers to rejuvenate the skin and treat conditions such as scars and stretch marks. Dr. Jafari completed her medical training at Albert Einstein College of Medicine and UCLA. As an artist and an Allergan Platinum-Plus injector and holders of several certificates, diplomas and publications, Dr. Jafari is an avid advocate of whole-face and body rejuvenation using non-surgical treatments (the so-called Liquid FaceLift procedures) for natural-looking results. Not only she has successfully treated several thousand patients with various cosmetic injections with great results, she also teaches and trains her peers in advanced techniques of various cosmetic procedures. Join thousands of other satisfied patients of Amoderm and explore new frontiers in non-surgical rejuvenation treatments! Amoderm Cosmetic and Wellness Medical Center president and medical director Dr. Elham Jafari has extensive training and experience in cosmetic and aesthetic medicine and a background in neurology and neuromuscular medicine, which gives her a keen insight into the anatomy of face, its muscles and nerves and an unrivaled expertise in non-invasive approaches to facial rejuvenation. Dr. Jafari is a leading provider of advanced non-surgical cosmetic and rejuvenating treatments, including liquid facelift procedures with natural-looking results. These offers are introductory and only valid for new patients at Amoderm. Please make sure to mention “Introductory Offer” at time of calling or checking in to get the specials. Limit 1 offer per person. Appointment required and subject to 48-hour cancellation or rescheduling notice or $50 penalty. Must be 18 years or older. Treatments must be used by the same person. All purchased treatments under the special pricing units must be used within the same treatment session. Radiesse special only valid for 2 0.8 cc syringes and cannot be prorated to 1 syringe purchases or used toward 1.5 cc syringes. All promotional pricing only apply to the quantities indicated and extra quantities if needed can be purchased at prices denoted by “Additional” above. Exclusions apply and treatment of certain areas are excluded from these offers. Offers are subject to change or termination without prior notice. No cash value. Offers cannot be combined with any other offers, specials, coupons or programs.